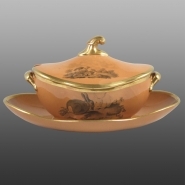 Reverse view of sauce tureen, cover and stand. 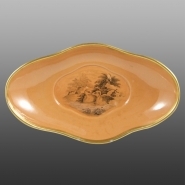 An earthenware sauce tureen, cover and stand in the Chalcedony body. Bat printed in black with with a pair of swans (P412) on the stand; a pair of rabbits and a ram and ewe ( P405, P406) on the tureen base and pairs of birds (P419 and P420) on the lid from the Animals Series. Not marked. Print references ( P numbers) from Drakard, David and Holdway, Paul. Spode Transfer Printed Ware, 1784-1833. Woodbridge, Suffolk, Antique Collector's Club, Inc., 2002. Print number P405 is taken from John Church's two volume Cabinet of Quadrupeds engraved by James Tookey from drawings by Julius Ibbetson. This was published by Darton and Harvey, Gracechurch Street, London in 1805. Print number P406 is derived from two illustrations in Buffon's Natural History translated from the French and printed and published by J. S. Barr of Bridges Street, Covent Garden in 1792.